E. Braun & Co. – WHAT IS JAMES WEARING? For generations E. Braun & Co. has been the go-to place for the finest in European linens, and today they are one of the few sources for exceptional embroidery and applique in both classic and contemporary styles. Their new luxe minimalist store at 484 Park Avenue brilliantly showcases linens that can’t be found anywhere else, and if you’re looking for an as yet unimagined compliment to your 18th century Flora Danica porcelain, well then have E. Braun make it for you! These people know the meaning of a well dressed table! And then there is bedding. One has to go no further to find a myriad of choices in the most luxurious of fabrics for sheeting, duvets and pillow covers. They have gorgeous blankets and the most wonderful goose down pillows – Everything of course can be customized, mixed, matched, and monogrammed. You’ll feel like you’ve slept a sumptuous night at the Crillon after experiencing an E. Braun & Co. appointed bed! I’m pictured here having just finished putting together a few very chic beds for one of my most discerning clients. 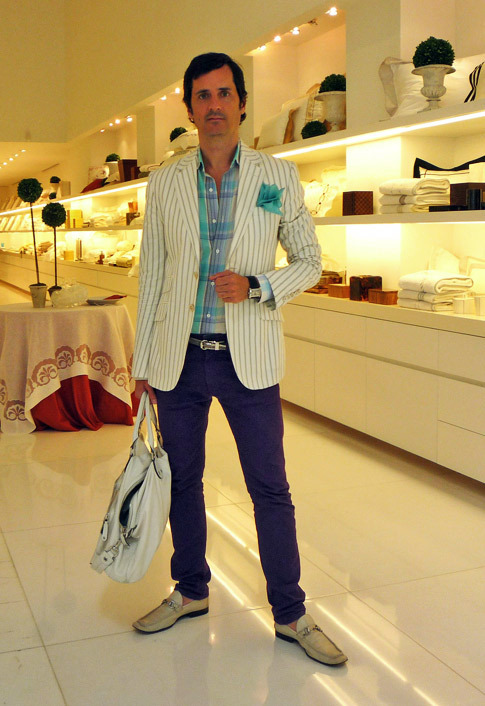 I’m sporting a white and charcoal striped jacket by Gucci, a linen plaid shirt in shades of turquoise,purple and white by Gucci, Charvet Paris turquoise silk pocket square, purple skinny jeans by Diesel, silver chain link belt, Ivory leather loafers and white leather bag all by Gucci. Vintage Cartier watch from Raj Tolaram.